There is no better way to express your love for camo than to create a beautiful satin dress out of your favorite camouflage pattern. My niece recently got married and couldn’t find the exact dress that she wanted. She wanted to use the Muddy Girl pattern from Moon Shine Camo and couldn’t find a local bridal shop that had what she wanted. We provided her with the camo satin fabric and she took it to a local seamstress who helped her design and create a stunning wedding dress as well as matching bridesmaids dresses and matching vests for the groom and groomsmen. The outcome of the dresses and vests were exactly what she envisioned and she said it meant so much to her being able to be a part of designing the entire wedding party’s formal wear. She ended up using our 3.5 oz. Soft Hand Moon Shine Camo® Muddy Girl® satin fabric for the bridesmaids dresses, sashes and vests. Her beautiful bride’s dress was designed using our 4 oz. firm hand feel Mossy Oak Winter® satin fabric and finished off the camo theme quite nicely. If you are more into traditional camo, maybe try using our 3.5 oz. soft hand Mossy Oak Break Up® satin fabrics for bridesmaid dresses. This pattern also goes really well with a Mossy Oak Winter which I think would be perfect for an entire bride’s dress. We also have in stock 3.5 oz. Soft Hand Satin – Moon Shine Camo® Undertow® which could be a nice complimentary blue within your camo wedding theme. So if you can’t find the exact dress you want and want to design your own wedding party entourage, our fabrics are exactly what you need to get started. If you are a seamstress or are a business looking for the best camouflage fabrics available these fabrics are for you as well. 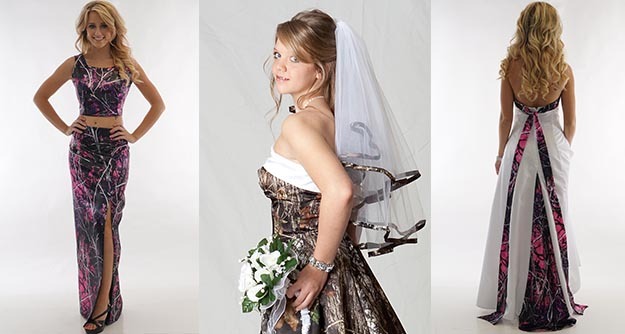 Check out our available satin wedding dress camo fabrics below. We will be adding even more camouflage satin fabrics soon so keep a lookout for new patterns that become available. If you can’t find a local seamstress, head on over to our friends at CamoFormal.com. They have some great dress selections using the very fabric that we sell! Hi Jen – thanks for checking with us. Please provide some details on what fabrics and quantities and I’d be happy to help you. Or, let me know what questions you need help with. Probably best to email me at sales@camofabricdepot.com.